If you like tech (like me) and if you like having your Bible study materials with you (like me) and if you like traveling light (like me), then I may have a trick for you that will allow you to teach your Bible study group by using a piece of tech you probably own, an iPad. My church has chosen to use Bible Studies For Life. It is the world’s best-selling, ongoing Bible study series, used by millions of adults, students, and kids every week. It’s super easy to prep for a session, and it is highly discussion-centered. I have found it gets groups talking and discussing Scripture in ways they never have before. To learn more about it, just click here. Although Bible Studies For Life has a print version of a leader guide (with easy-to-follow group plans, commentary, and more), I buy the digital version from LifeWay for just a few bucks (13 Bible study sessions in all – a really great deal). It is emailed to me as a PDF, and that’s when the magic begins! STEP 1: Download the iStore app, Good Notes. It allows me to upload PDFs into it, and once they are available to me in the app, the PDF becomes alterable. 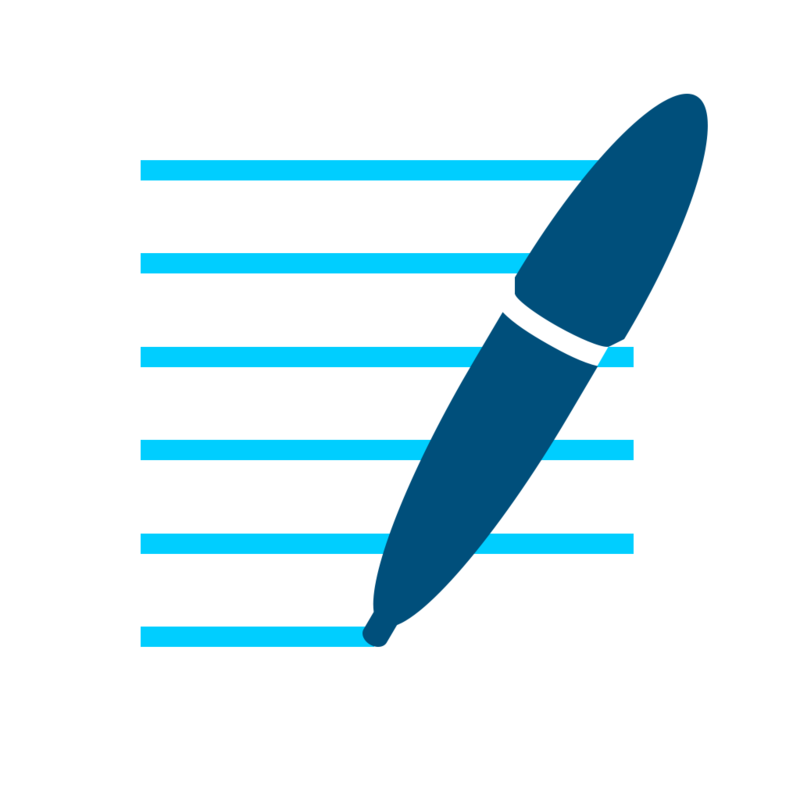 I can add text via the keyboard, hand write notes, add images, add pages, highlight text, etc. It’s super easy, intuitive, and flexible. The Good Notes logo is pictured to the right. Perhaps you have another PDF reader that you like to use? If yes, then you’re set – just use that one. STEP 2: Open my leader guide PDF in Good Notes. I receive the digital version of the leader guide via e-mail. I simply open the attachment on my iPad, and then choose Good Notes as the app in which I want to view it. STEP 3: Alter the Leader Guide in Good Notes. Once my Leader Guide is downloaded to Good Notes, I can use the app’s tools to change things in my lesson plan. I can add an illustration, add notes to myself about things I want to say or do with my Bible study group as we work our way through a Scripture passage. I can add a page or two and include commentary I want to reference during the study. I can draw an “X” through a question or suggested activity I don’t want to do use. It allows me to be in the driver’s seat and customize my group’s study plan. STEP 4: Teach! Rather than using my print version of a Leader Guide (it’s about 9X12), I simply open Good Notes on my iPad and teach with my iPad in hand. I can quickly use the “two finger pinch” to zoom in and out as needed. By having the PDF version of my Leader Guide in Good Notes, it allows me to work on my group’s Bible study session during my lunch hour or other “down times.” It’s made me more productive, and wherever I go, my iPad (and my Bible study materials) go with me. If you happen to use LifeWay’s ongoing Bible study curriculum (Bible Studies For Life, Gospel Project, or Explore the Bible), you can also purchase the digital copy of your leader guide and use your tablet as a new teaching tool. See an example of how I used Good Notes to modify the opening page of a Bible study session I led (image is below). I used many of its key features: added a text box, added a hand-written note to myself, and highlighted some text. Enjoy! PS – If you don’t follow my blog yet, consider this your invitation to join a growing crowd of group leaders and church leaders…soon the blog will have almost 1000 searchable posts! Click here to go to the home page of my blog. Frank, here is a link to the Daily Discipleship Guide (Winter) digital bundle ($3) that includes the weekly studies and teaching plans: https://www.lifeway.com/en/product/bible-studies-for-life-adult-daily-discipleship-guide-winter-2019-digital-P005806490-2019-WIN. 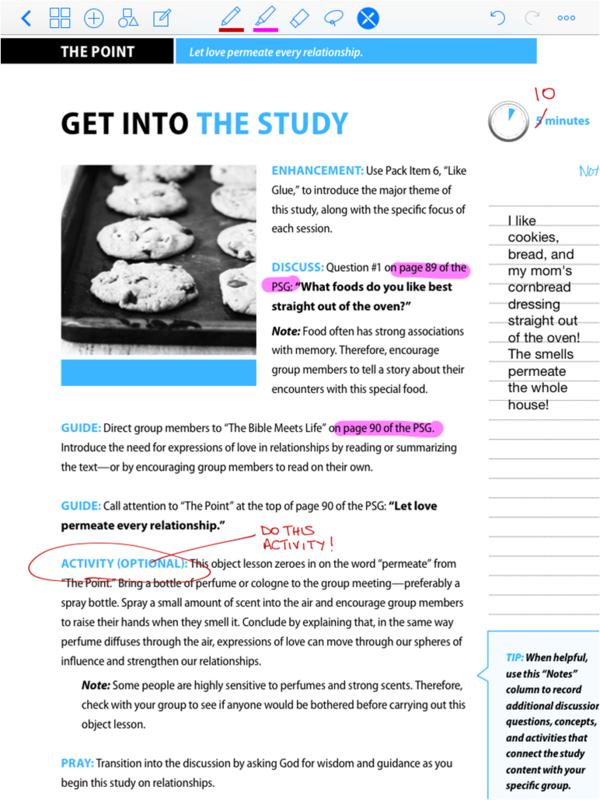 If you use the “all adult” version in the PSG (personal study guide), here is the link to those digital files: https://www.lifeway.com/en/product/bible-studies-for-life-adult-personal-study-guide-leader-guide-winter-2019-digital-M00051302.